When I found the journey cave, I was surprised, frightened and thrilled. I had heard about hokey Shamanic drumming but had never tried it. So, I plonked my avatar down on the blanket and started up the drumming. A lot of my fears disappeared even though I didn't understand the purpose of the drumming. Years later I found a book with CD of drumming, followed the book's instructions, and had my first Shamanic journey. And then I found a local first-life Shaman who offers monthly journeys. It wasn't anywhere near as scary as I thought. The most scenic (and peaceful) way to arrive at the cave is to take a canoe from the dock across from the library and head around to the right. Once you get to the cave, you'll have to fly up or right click and "sit" on the blanket, as the water is a few meters below the lip. You can also try walking into the cave from the Native American ritual area on the other side, but to do that you'll have to walk through black-prim-total-darkness. The blanket offers journeys from 10 minutes to unlimited. I suggest you do a little research on how to journey before using the blanket. On the other hand, you might enjoy the journey more by simply going with the flow. There's a tiny rash of Machinima videos being recorded in the pagan community. Anam Turas and others were included in a recently published video about Beltane. 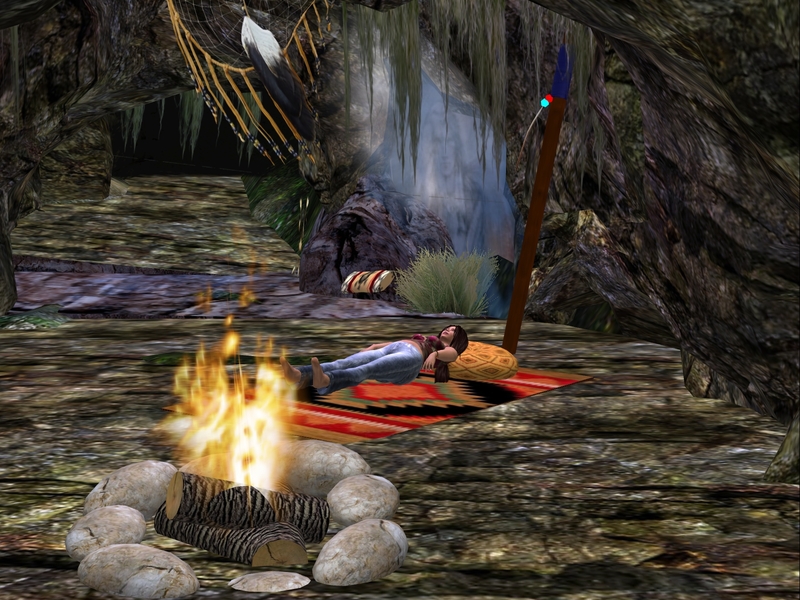 The same video group recorded the United Healer's of Second Life healing meditation this past Saturday. I'll let you know when the video comes out. There was a Totem Animal celebration dance last week, which happened on very short notice. If you're interested in keeping up with the Totem Animal events, contact Shambala Kimono. Apparently she doesn't have a schedule yet. What a fascinating use of SL. I was part of a RL drum circle myself once, and it was a good day when I could find "one" and stay there. Drumming and trance have always fascinated me. I guess with an avatar you only need to close your eyes and listen to get the same sort of powerful effect, though it helped me when I could feel the drumbeats as well as hear them.